Let’s assume you already have the proper authentication between your email platform and your domain the platform is sending email on behalf of. If you don’t know what that means, ask your IT team to verify if you do/don’t have authentication, because this piece is the most important thing you can do to have any hopes of reaching an inbox versus a spam folder. Authentication is the first thing servers review to differentiate a legitimate email from a spam email where their actions will be to bounce, quarantine or route to the intended recipient’s inbox or spam folder. I spoke on an email best practice webinar for ASAE in 2017. At that time, the subject line was given the most importance for incenting the recipient to open the email behind the From Name; that has definitely evolved since then. Today, an equal number of eyes are on the preview text and preheader text as on the subject line. Just as much thought should go into one or both, because if the email isn’t opened, it’s pointless. The terms preview text and preheader text are oftentimes used interchangeably but actually are very different, technically speaking. When the recipient of the email views their inbox, however, they wouldn’t really notice what the difference is or care for that matter, unless something looks visibly wrong. Like this example of where the email preheader is pulling in the URL to the actual RSS feed instead of something more useful for a recipient. This could have been avoided if preview text was used in addition to the preheader. Most emails have preheader text pulled into the inbox preview because most emails have a preheader. Not all emails have preview text. The reason to use preview text in addition to a preheader is if the inbox preview is pulling in something that isn’t useful or wanted like the example above. Let’s put a visual to what we’re talking about. This is a screenshot of my mobile Gmail inbox. Do you notice a difference between preview text and preheader text? I can’t. 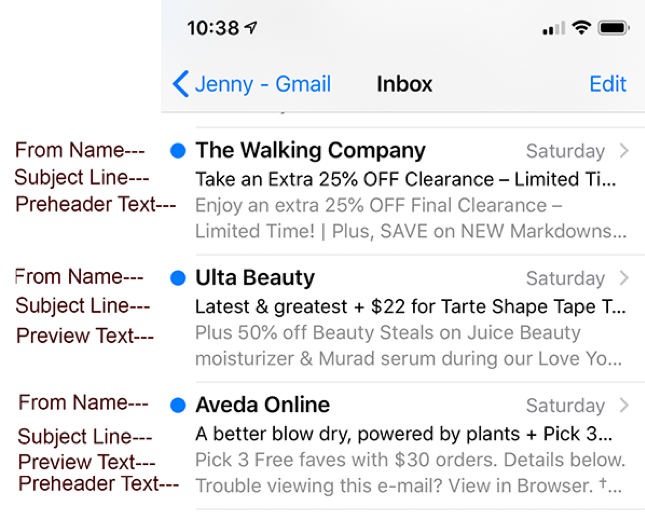 It’s difficult to see a difference between preview text and preheader text unless you open the email and noticed that some of the text you saw in the inbox preview, was not in the email itself. The only time you see preview text is when you are previewing your email inbox. You will never see it in the email itself. Preview text is text that is only visible when you are previewing your email inbox. 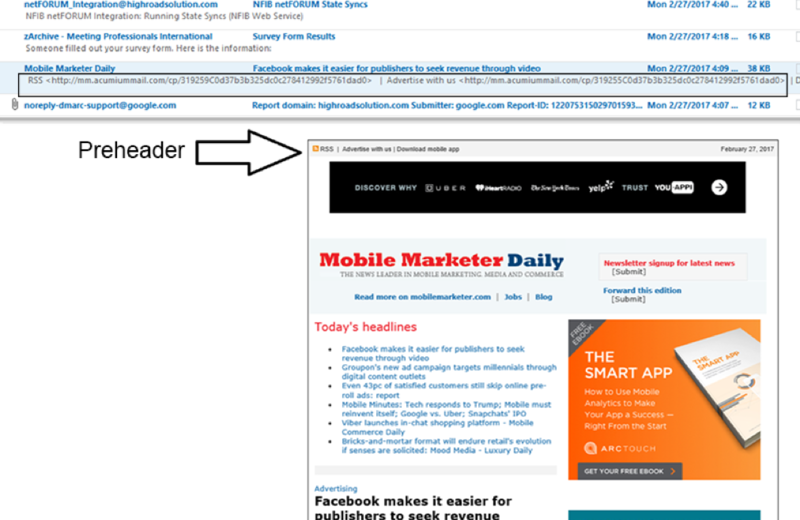 The only way email marketers interact with preview text is in the HTML code of the email. If you don’t have access to your email’s HTML code or don’t know how to add preview text to your email’s HTML code, then ask your design team if preview text is possible. Preheader text is a short amount of text at the top of your email before the email body. 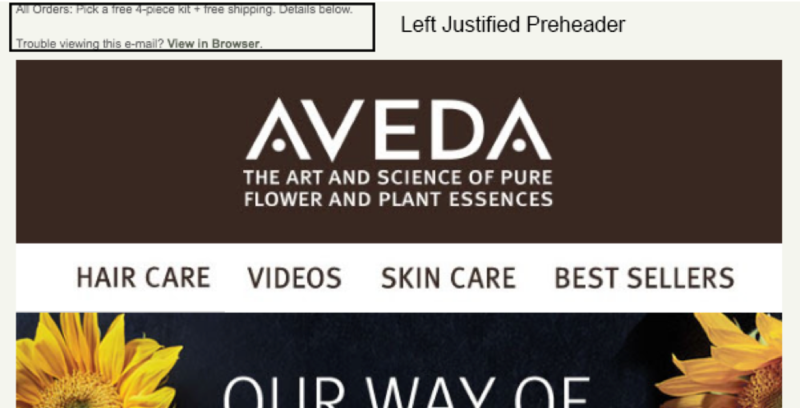 Typically, it contains “View Online” or “Add us to your Safelist” text, but since that doesn’t do much to incent a recipient to open your email, you can make a clever use of additional text before the View Online like both Aveda and The Walking Company do in the examples below. Should be between 30-70 characters depending on which email clients your recipients are using. Keep it closer to 30 for mobile or 70 for desktop clients. If you don’t know, you can run a Litmus Analytics report to show you if your email platform reporting doesn’t show you. Use sentence-case capitalization for subject lines. Avoid excessive punctuation – !!! 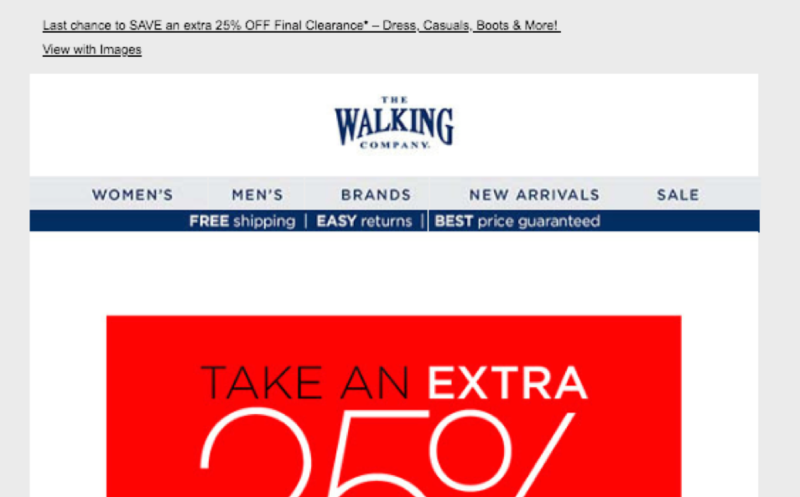 Make the subject line consistent with the message copy and offer. Keep it short and punchy with most important content first (6-10 words). Avoid spam triggering words like, win, free, limited time, etc. Symbols/emojis should be used with caution as they are not supported in all email clients. You CAN use emoji-like characters as long as you encode them correctly as this is the only way to ensure it is supported by all email clients. With email marketing, you are competing in the inbox with a lot of other players. When average open rates trend between 15%-40% when sending to opt-in subscribers, that means that 60%-85% are not opened at all. There are many possible reasons for that, but when testing your emails, be sure to see what they look like as they land in your inbox. 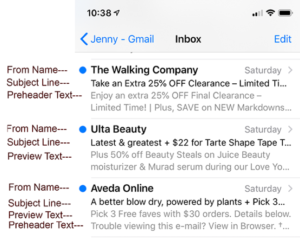 If you don’t like what you see, then optimize your email’s preview text, preheader text and subject line so all text makes sense when previewed and read together.